A selection of multi-stemmed, drought-tolerant mallee eucalypts, planted in belt form and integrated with crops in dryland agricultural areas of Australia, may be able to produce biomass as a commercially attractive feedstock for biofuel production. This study aimed to determine if small (40-50 cm high) bunds along mallee belts could trap otherwise underutilized surface water runoff within paddocks, thereby increasing water available to the mallee trees and their growth rates. An experiment was established in 5 year-old Eucalyptus polybractea (RT Baker) mallee belts near the town of Narrogin in the central wheatbelt area of Western Australia. Bunds led to significant (12%) increases in biomass accumulation after about 2 years and 35% increases at around 3 years. Bunds also led to significant increases in predawn leaf water potential and significant decreases in soil water deficit within 12 months, which persisted for the remainder of the 39 month trial. 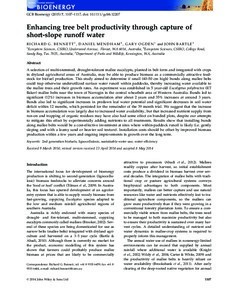 We suggest that the increase in biomass accumulation was largely due to increased water availability, but that increased nutrient supply from run-on and trapping of organic residues may have also had some effect on bunded plots, despite our attempts to mitigate this effect by experimentally adding nutrients to all treatments. Results show that installing bunds along mallee belts would be a cost-effective investment at sites where within-paddock runoff is likely (i.e. gently sloping and with a loamy sand or heavier soil texture). Installation costs should be offset by improved biomass production within a few years and ongoing improvements in growth over the long term.